While the web site is under reconstruction in 2013, pressing the "Home" button, or clicking on the Tui in the header to these pages will take you to the temporary home page, where you entered this site. Click HERE to return to the "real" home page. This page is one of several in which we say "thank you" to people who have helped us in various ways. Others include the sections on sources of information, linked to this in the menu in the header to this page (and in the short cut below), the news page, and most of the pages dealing with particular plants and plant names. The language garden did not just spring out of nowhere, and so on this page we will mention many of the people who helped us transform five acres of virtually bare paddocks into a haven for birds, butterflies, and a variety of endemic, indigenous, and exotic plants. This process started in December 1996 when our family trust acquired the land, and has continued, with periods of almost frenetic activity alternating with quieter times, ever since. The transformation, of course, is still in progress, and the language garden has given it a new and exciting focus. We decided to name the property "Tūmanako" (anticipation, hope), to symbolise our desire to use the land to provide a sustainable source of food for ourselves and our friends, and a haven for some of the native wildlife, animal and vegetable, that once thrived here and in other parts of New Zealand. It is still, and will remain land held in trust for members of our extended family for as long as we have the resources needed to maintain it, but we also would like members of a wider community to be able to enjoy it with us. Nena with one of 50 kauri saplings and an akeake ready for planting, Spring 1997. Pride of place in any list of workers on this land must be conceded to the late Nena Benton, a remarkable woman who combined academic excellence, a passion for social justice, and the capacity for sheer hard physical work which would have put many a younger person to shame during the last 10 years of her life. She died at home here on May 15, 2007, at the age of 67, after a long battle with metastasized breast cancer, during most of which she had continued to work actively in her beloved gardens. By clicking on the links, you can read a brief biography, some of the tributes that were paid to Nena at her funeral, and an obituary that appeared in the Waikato Tree Crops Association Newsletter. Second place equally certainly goes to our son James, who set up a comprehensive irrigation system to make sure that the newly-planted trees survived their first year, planted hundreds of seedling trees and shrubs, many of which he raised himself from seed, and spent countless hours with weedeaters, mowers, slashers, sickles and other instruments of constructive destruction keeping the weeds and grass at bay, composting, mulching an otherwise creating an environment in which the new biota could survive. For the earlier years, at least, I would come a distant third in the manual labour stakes, although I did do a lot of conceptual work -- the rest of the family told me that I had Tolstoy's manner as I walked around surveying what had been accomplished and meditating on what yet needed to be done, but not his cheque-book; they used to smile when I would wax lyrical about the trees "we" had planted (I had planted some of them!). Our youngest son, Alan, also did some planting and has done a lot of mowing and raking on his visits to the farm, but since he lives in Wellington, 500 km to the south, his contributions, too, have been mainly in the role of ideas, especially advising with web design and other IT matters. More recently, I have had the good fortune to become married once more to someone who shares the family's enthusiasm for developing the property as an oasis for plants and wildlife. She too has contributed many hours of hard labour, including effective and timely use of her newly-acquired skill at using a chain saw! We have also been fortunate to have had the assistance of a number of friends and relatives who have stayed here for varying periods of time, and have contributed a lot of free labour at critical points in the development of our various projects. Most notable of these have been Nena's sisters Milagros, who stayed with us was several months in 2000, and Alva, who spent the first few months of 2006 with us. We were also given a great deal of help by Mailo Carillo Peña from the Basque country and Tina McIvor from Wellington. Two students from the University of Waikato, Bevan Lye and Joel Gilmore also gave us tremendous assistance in moderating the advance of entropy in 2006 and 2007 respectively, officially for some moderate financial recompense but in fact both insisted on claiming for fewer hours than they actually contributed. Our friend Alfred Harris, at times assisted by his son Sam, also tackled blackberry and assisted with other urgent tasks for several months in 2006-7, in return for a koha which would barely have covered their expenses in getting here and home again. To these, as well as quite a number of other family members and friends who have given spontaneous help (like Wayne Johnston and his brother, who repaired a boundary fence after the person contacted to do it disappeared without trace, just before an impatient grazier released his cattle into the adjoining paddock, and Hemi Rau who on many occasions before and since has helped us deal with incursions of cattle from neighbouring farms), we are very grateful. Without this kind of assistance we simply could not cope. 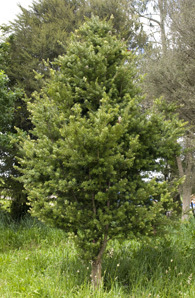 28 January 1997, photographed October 31, 2010..
"Please accept this small gift of a kauri tree. A living native kauri tree is symbolic of the importance of Liam's life, a reflection of his love of the outdoors, and the continuation of his memory." Maryanne Kroon and his other A.C.C. colleagues. The "language garden" is part of a broader vision, outlined in the introductory paragraphs of this page, for the development of "Tümanako" as a kind of haven for visitors as well as for the people who live here. Many people have contributed to this vision; in fact, practically everyone who has come here has made some very helpful suggestion, or provided a comment supporting, adding to, or suggesting away of putting into practice an idea that someone else has given us. Our friends David Szanton from San Francisco and Sr Makareta Tawaroa RSJ, from Kaiwhaiki, Whanganui, gave us some very good ideas about arranging things so that artists, writers, or people just wishing to contemplate could find a temporary home here. Other good friends, Wi Kuki Kingi, Jr and Tania Wolfgramm, gave us great encouragement in transforming the "language garden" from an idea to a tangible and visible reality. In September and October 2007, I received a great deal of help in advancing the comparative aspects of this idea, as well as further encouragement to proceed with its practical application, from Professor Will McClatchey of the University of Hawaii (now Director of Research at the Botanical Research Institute of Texas), Daniel Forman of the State Department of Land and Natural Resources, Honolulu, Kawika Winter and Bino Castelo at the National Tropical Botanical Garden, Limahuli, Kaua’i, and Greg Trifonovitch and his family in Kea’au, Hawaii. Professor McClatchey has since made two visits to the garden, the first, in April 2012, with Dr Peter Matthews from the Osaka Natural History Museum in Japan, and the second a year later accompanied by his wife Valerie. My ten week stay in Hawaii was made possible by the generosity of our friends Brian and Bonnie Murton who allowed me to use their home in Honolulu as my base. We followed this up in June 2011 with a seminar on the future of the garden attended by people from a number of organizations, includng the University of Waikato, the Hamilton Polytechnic, the Forest and Bird Protection Society and the Tree Crops Association. This also generated some excellent ideas, which only a dearth of resources has for the moment prevented us from following up as effectively as we would like. Since we moved to “Tümanako”, we have planted trees in memory of members of the family and close friends who have died, and other friends and relatives have from time to time provided or planted trees and shrubs with this in mind. We brought from Wellington a kauri tree given to us by the staff of the Accident Compensation Commission in Wellington in memory of our son Liam and his wife Katrina, who were killed in a plane crash in 1996, and planted it at a gathering of family and friends to mark the occasion and have our newly-acquired house blessed on the first anniversary of the accident. Trees in their memory were also provided or planted by Ian Waddell, Mabel Waititi, Professor Ted & Vin Glynn, Rangiwhakaehu Walker, Dr Ngapare Hopa, Ted & Rahera Douglas, and Josephine Haulangi. After Nena’s death, Ngapare Hopa, the Douglases, Mere Berryman and Rangiwhakaehu Walker brought us trees to plant in her memory. By a fortunate coincidence, most of these trees are from species that belong within the language garden. Alfred Harris and Kathryn Atvars have both provided us with swan plants to keep the progeny our little colony of resident monarch butterflies in food. Ngaronoa Silver provided us with a small plantlet which has grown into a clump of giant taro, and with the original shoots of a very fine variety of harakeke (NZ flax) from Rangimarie Hetet’s garden which have now grown into vast clumps, and their leaves used to good effect by a number of skilled weavers who have helped us keep them at least partly in order (unfortunately these were chomped vigorously by hungry invading cows in 2008, and a herd of young steers in 2009, which still gives many of the leaves a bedraggled look). Dante Bonica also gave us some plants of a traditional variety of taro from the gardens of an abandoned Te Kawerau settlement near Woodhill, Kaipara. Dr Geraldine McDonald, Catherine & Peter Lythe, and Professor Janet & Tony Holmes sent us some money which they asked us to spend on trees to be planted in Nena’s memory. The Waititi Family (Mabel [Motatau], Tukaki [Kaikohe], Waina [Kaeo], Ngawai [Kaikohe], Janet [Rotorua] and their families), and the Eslao, Duque and Buencamino extended families in Manila and Pangasinan, Philippines also sent generous contributions to help us defray some of the funeral expenses; we have decided to put all this money into new plants and trees, also in loving memory of our "First Gardener". All in all, these people have contributed an amount close to $2000, which I have put in a special account to use for the purchase of new trees and other plants specifically for the language garden. Nena's sister Dr Elnora Eslao Duque has also donated the money held in a joint account that she had with Nena, also for the purchase of new plants, which has almost doubled the amount available. If we had been able to keep out the cattle, we would have done much of the new plantingduring the winter of 2009, so that the vegetation would get a chance to establish itself before summer. However, we had to contend with another invasion which resulted in the loss of several newly planted trees and damage to others, plus a resurgence of the rabbit population which somewhat disrupted our plans - planting has continued since then, but at a slower rate than we had hoped. Almost everyone we have told about our plans for the language garden has been both supportive and enthusiastic. This is, of course, very encouraging, but also somewhat disconcerting -- it means that there is no turning back; this is one idea that if at all possible will have to be brought to a visible and tangible fulfilment. Quite a challenge, but one which, with the help of our friends, we are determined to meet. This is a very small-scale operation with few resources. However, we do think that it has great potential, and appreciate very much any kind of help that people care to offer. For more information about the kind of help we need most, just click here to go to the You can help!" page.